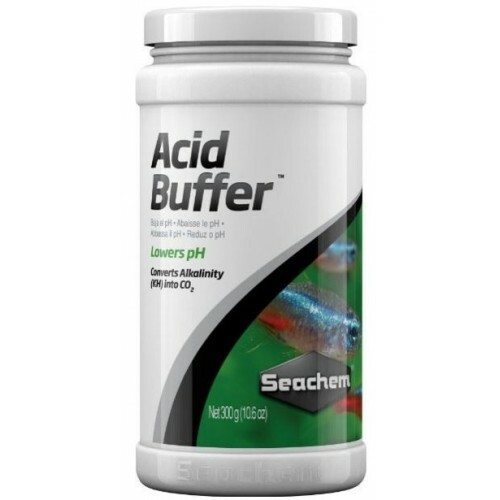 What distinguishes Acid Buffer™ from other buffers is that it does not contain phosphates. This makes it ideal for the planted aquarium, where excess phosphate could contribute to undesirable algae growth. To lower pH, use 1/4 teaspoon (2g) for every 80 L (20 gallons) daily until desired pH is reached (this dose lowers alkalinity by about 0.2 meq/L (0.6 dKH)). Larger doses may be required in very hard (KH) or alkaline waters. In order to adjust pH gradually, or if water is soft or not well buffered, use Acid Buffer™ with Alkaline Buffer™. When using Alkaline Buffer™ & Acid Buffer™ together to target a specific pH, utilize the suggested ratio chart. This chart is based on use in RO or RO/DI water and ratios may need to be adjusted for use in tap water. Warning: Will causes serious eye damage. Always keep away from eyes and wear proper protective clothing.